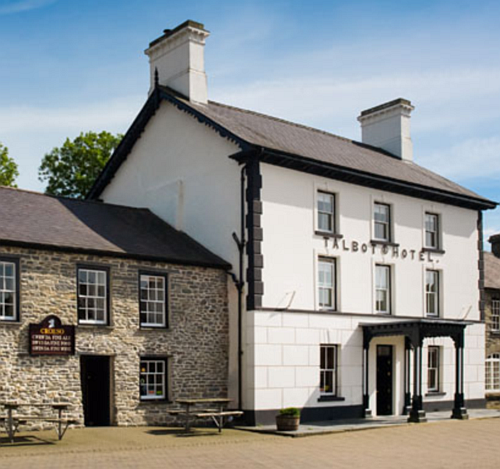 Y Talbot Hotel Tregaron, Wales. Y Talbot has lots to offer, whether you’re visiting for a quick drink, a leisurely meal, a relaxing break, a celebration dinner or a business meeting. Besides our cosy and characterful pub, guests may enjoy our contemporary restaurant, superb bedrooms, function rooms, stunning gardens and guest parking. We welcome group bookings for celebrations or get-togethers, large or small, in our cwtsh, restaurant or function room, and are happy to devise a special menu for you. Our location at the foot of the Cambrian Mountains and close to the Ceredigion coast makes Y Talbot an excellent base for exploring West Wales.